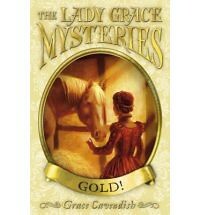 I love the Lady Grace Mysteries. It appears it's going to be a 26-volume series (one for each letter of the alphabet) but, alas! after Feud, they stopped being published in the US. When I was in London in April, I raided the bookstore for G-K. L is coming out soon, but only for British readers. Big things are happening at court! Lady Penelope is getting married and the palace is a tizzy with preparations and celebrations. But, in the middle of it all, the gold that is part of the Queen's loan from France is stolen. Every witness has a different story and none of the clues match up. Can Lady Grace solve this one? Grace is a headstrong girl that might be too independent for her time, but look at who her guardian is-- Queen Elizabeth I. Also I love the way the authors of this series work in so much historical detail so seamlessly. It never interferes with the actual story. There's also a great glossary and author's note. An excellent addition to an excellent Middle Grade Mystery series. Where I got the Book: Own copy. I remember wanting to read these when the series first started, and forgot all about them. I'll have to see if the library has any. Isn't it great to know that a series will be around for many more volumes! What? Why only in the UK? I call unfair!